We’ve had a couple discussions around how to use sound design and the capturing of audio that can push a story forward so I thought I’d share a couple videos that highlight in an entertaining way how you can change the context of a video with audio. For the record, I really wish I had thought about doing my sound design projects in film school the same way. While I had a ton of fun redoing the audio in Jaws, I think cutting out the original audio of a music video and doing sound replacement to it is genius, and it really makes some drastic changes to the feeling of the video. These videos are shown for artistic and entertainment purposes, which can be in conflict with the ethical guidelines that we heard during Peter Laufer’s course recently. There is a definite fine line that we as journalists have to be cognizant of as we produce pieces. Should you ever have questions relating to whether or not you are pushing ethical boundaries with the way you use any of the media you produce you can always reference The Society of Professional Journalists Code of Ethics. My personal opinion is that sound design (the specific manipulation of sound) is bordering on breaking ethical guidelines, but that if the use of sound design, or foley does not change the context within the story, and provides a richer environment for the viewing public to learn from and engage with your story it can be used, provided there is some transparency in the way you tell your story to account for the use of the effects. Jasin Phares from Meditation 4 Madmen on Vimeo. This video strikes me as a very powerful profile piece. I think the use of black and white was very intentional in keeping the feeling of the video “vintage” to match the content of the video, making a vintage drag racing bike. Overall, the use of detail in this short video is also done really well. I wouldnt typically think to shoot detail shots of a man’s beard but they work really well here (1:44) and they help to add a humanizing anchor to all of the detail shots of the bike. Something that I think is really powerful in videos, and that Meditation 4 Madmen does really well, is to bring the viewer into the experience. At 1:02, the video runs really quickly through almost indecipherable images and stops on the shot of the man riding the bike. The jumpy music also helps to add the effect here. What I thought worked about it is the choice of quote, sound effects and editing techniques to let the viewer feel like he is experiencing the ride with the biker, and not from a computer screen. What do you think? Does it work for you? The Balloon Highline from sebastien montaz-rosset on Vimeo. I feel like in class we are always talking about setting up and getting that perfect shot. Frame the shot just so, make sure everything is in focus, get the proper lighting and what not. This is all very well and good but I think that we need to remember that in the field as multimedia journalists we won’t always have the time or the presence of mind to set up for that perfect shot. With that in Mind I give you the Ballon Highline. Now although in this piece each shot is deliberately chosen and framed, they had the time to set those things up. What i liked about what they did was that they did not constrain themselves to getting pure steady shots. All though out the piece the camera is shaking and moving around as if they are not on tripods, moving along with the people in the scene. I think they did this since they knew their shots up in the balloons were not going to be steady so they had the entire piece feel like it was unsteady to create cohesiveness. In this instance the shots were purposely chosen and it was a style that the filmmakers went for. But I think it is a good reminder to us that not everything needs to be in a perfect steady shot. Every so often we should learn to embrace the chaos and roll with the shots that work for us. I had a shift at the reception desk at the NWFC yesterday, which is to say that I had 8 hours to catch up on some of the New Yorker I have been neglecting due to school. One of the articles I read was about Diana Nyad and her various attempts to swim from Cuba to Florida. One some of these attempts, including her final one, her nephew was filming a documentary about her. At one point he captured the moment when she got stung by a box jellyfish. This video almost feels like an example of reporting about someone without interviewing them. After Diana got stung an EMT jumped in to help her. Unfortunately, he was also stung and jumped back out. We see Diana screaming and obviously in pain, so the viewer definitely gets an idea of what it might possibly feel like, but Diana kept on swimming. The EMT got out and tended to the stings. Additionally, he talked about the experience, and how the pain continued to get worse. He said he was in such pain and could’t imagine how Diana experienced what he had and was still out there swimming. So, the filmmaker wasn’t able to put the camera in Diana’s face and ask her about the experience, but he got lucky when the other guy got stung because he was able to get him on camera talking about what it was like. I found this video a few weeks back and was planning to post it soon, not having noticed that the star is Peter Seeger. Watching it again today, I took note of this fact, was embarrassed for not having notice it before, and felt the need to post this immediately as a nod to an inspiring legend who passed away recently. 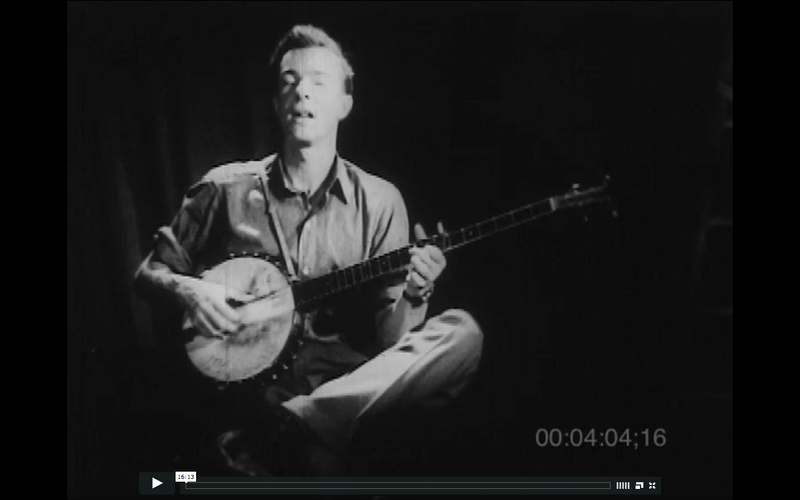 The film, staring Pete Seeger and Woody Guthrie, was made in 1946, and was shot on a 35 mm. Titled To Hear Your Banjo Play, the piece focuses on the birth of banjo music throughout the Southern United States. I thought that it was beautifully captured, most of the shots were still and you could tell that a lot of thought went into the composition. Shots such as the two men, back to back, swinging their pick axes, or looking at the train through the trees, each image was done with great care. I find the idea of a “national park of intellectual property” very intriguing in relation to our discussion last week around copyright issues. Here is a sight that seems unconcerned with money and possessiveness of the work but rather is based on the desire to preserve and share a piece of our collective culture. I find this quite refreshing! Seeing as last week marked the high water point for 30 second stories in the form of Super Bowl commercials, I decided to share the “favorite” ad according to most outlets. It’s the story of a puppy who falls in love with a horse, and refuses to leave. It’s ultimately a story about both their owners finding love by having their animals bring them together. It’s entirely hokey, but it is remarkable that in exactly one minute and one second, we learn this entire story…without words. In fact, that might be why it feels like such a holistic piece, because we’re watching it visually, not having to wait for the words to make sense. How this in anyway makes us want to buy Budweiser, I have no idea –which I think is also a legitimate question. That said, note how the visuals tell the story of two people’s lives in such a short amount of time.